Two years ago, Hammond-Suzuki introduced the 'New B3' organ, which proved to offer the closest ever digital reproduction of the original Hammond B3 organ's sonic and performance characteristics (see my review in SOS July 2003). Naturally, there is a lot of very clever digital technology involved in the New B3, but this is combined with some relatively crude mechanical switching techniques which were derived directly from the original Hammond keyboard design dating back nearly 80 years! This rather bizarre combination of old and new technologies was required because no other way could be found of replicating the unique multi-contact switching action and contact-click characteristics of the original. These factors have a profound effect on playing technique and are essential to reproducing the character of this fantastic keyboard instrument. The New B3 has been a success, and was widely acclaimed on its release by B3 aficionados including the late Jimmy Smith. It achieved what many attempts — by Hammond themselves as well as other manufacturers — failed to do, which is to accurately recreate the original B3's characteristics. However, because of the way it has to be made, the New B3 is inherently a very expensive instrument — £15,000 pounds in the UK. So although every keyboard player needing that classic organ sound would undoubtedly want one, it is priced well beyond the means of many. It is also very large, and, although a lot lighter than the original B3 and its stablemates, still a bit of a beast to be lugging around to gigs in the back of a car. Enter the new Hammond XK3, which was launched towards the end of last year. This is an all-new single-manual performance organ following on from the well-known XB-series keyboards, but the XK3 is particularly significant because it embodies all of the sophisticated digital tone-generating technology of the New B3. However, instead of the complex, expensive and bulky multi-contact keyboard design of the New B3, the XK3 controls the sound-generating electronics with a much simpler standard MIDI keyboard design, and the organ is housed in a more easily portable package. So if the playing characteristics have been compromised slightly from a purist's point of view, the result is a greatly reduced price and a far more convenient package for the gigging musician. However, from a sound point of view, this new keyboard has to be the best-sounding single-manual Hammond yet, and by quite some margin. For the intricate details of the digital technology I would recommend reading the earlier review of the New B3, since the underlying VASE digital technology is identical. 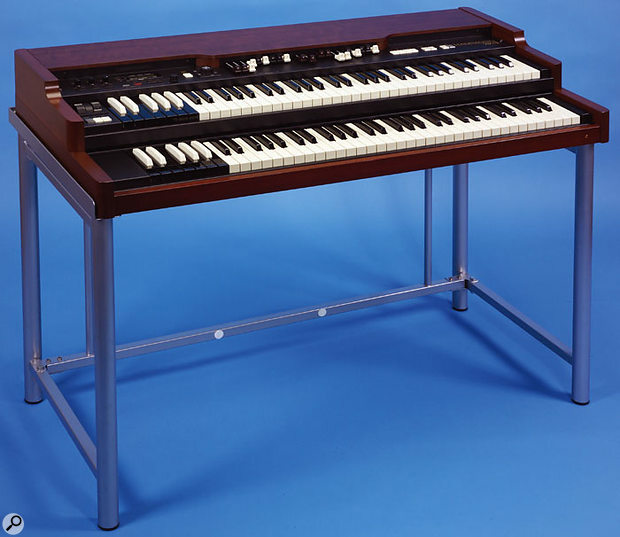 To briefly recap, though, the system digitally emulates two complete sets of 96 independent tonewheels (to provide independent upper and lower keyboard configurations), complete with controllable amounts of 'leakage' (crosstalk) and different settings for foldback (the duplicated notes at each end of the keyboard which play an important part in the characteristic Hammond sound). Instead of switching the individual outputs through multi-contacts below each key, the XK3 employs a much cheaper digital switching arrangement, coupled to a sophisticated and configurable key-click generator to create something close to the multi-contact glitching of a real tonewheel organ. Furthermore, this 'standard' keyboard incorporates note velocity facilities to control external keyboards or sound generators via MIDI. 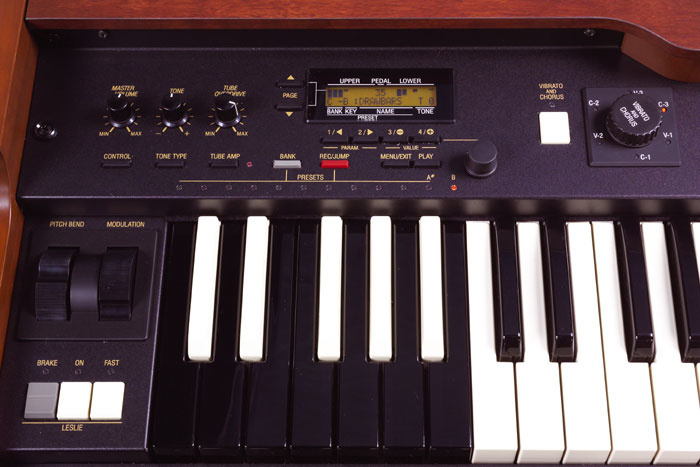 The keyboard is a traditional 'waterfall' design with flat-fronted keys, and has the familiar reverse-coloured preset keys in the bottom octave — although these are not the heavy latching switches of traditional console Hammonds (or the New B3, for that matter). While the New B3 was designed for use with the XB122 Leslie and its integral valve power amplifier, the XK3 has a clever valve preamp built in to provide genuine tube-amp overdrive and distortion effects. In fact, the valve preamp is configured as a dual-band affair to ensure the harmonic clarity and detail is retained even when being heavily overdriven. The XK3 also employs the same DSP-based scanner-vibrato system as the New B3 organ to provide the complex chorus and vibrato effects unique to tonewheel Hammonds, but takes this signal processing a step further by also incorporating a DSP-based reverb and Leslie simulation as well. This can be disabled if you wish to use a genuine external Leslie (or similar) cabinet, but it does provide a very convincing and convenient built-in effect for live sound applications. A standard 11-pin interface is provided to couple the XK3 to modern Leslie systems such as the XB122 or the new portable 2121/2102 system, which although sold separately, was also supplied with the review XK3, and which I'll be discussing in detail towards the end of this review. In addition to the 11-pin Leslie output, there's a pair of unbalanced line outputs on quarter-inch sockets, which provide a stereo signal if the internal Leslie and/or reverb effects are used. Nor does the connectivity end there — in addition to a headphone jack, there's a mono insert point with separate send and return sockets operating at a nominal +4dBu (the return socket can be used as an external input as well, if required), plus further quarter-inch sockets to accept footswitch and standard volume pedal control inputs, and even a latching DIN socket for the dedicated Hammond EXP100 expression pedal which uses traditional opto-sensors. While the New B3 only offered MIDI Out, the XK3 has a pair of MIDI In sockets in addition to MIDI Out. The multi-contact keyboard arrangement of the New B3 prohibited external MIDI control, but as the XK3 employs electronic note switching, MIDI control is available here, allowing the new organ to be controlled remotely from a sequencer, for example. The two MIDI In sockets are provided to allow separate external keyboards or controllers to access the lower manual and pedal sound-generating elements independently. The MIDI Out socket contains merged data from the external lower and pedal controllers (if in use) and allows other devices to be controlled from the keyboard. Up to three external zones can be configured through the menu system, specifying the keyboard note ranges which are sent to the required MIDI channels. Like its big brother, the XK3 also has a socket for a Compact Flash memory card which can be used to store all of the keyboard's settings or to load new settings. Power is connected via the usual IEC inlet with an adjacent power rocker switch, but there is no provision to select the mains voltage — European models will only accept 230 to 240V. While the XK3 is a single-manual keyboard, its sound engine offers two complete sets of digital tonewheels and consequently, there are two sets of real drawbars to allow the keyboard to be split for upper/lower configurations. There is also a separate bass pedal section derived from the lower keyboard tonewheel set. For many players, this ability to split the keyboard is perfectly sufficient to allow the traditional left-hand bass with right hand comping or solos, but with only 61 playing keys available, things can get pretty cramped sometimes. However, the second set of tonewheels and drawbars can be controlled independently from any external MIDI keyboard, and the bass-pedal section can be controlled from a suitable MIDI pedalboard such as Hammond's own 13-note XPK100, for example. The ability to hook in an external MIDI keyboard is great, but it gets better! Hammond have produced an optional lower keyboard specifically for the XK3 called the XLK3. 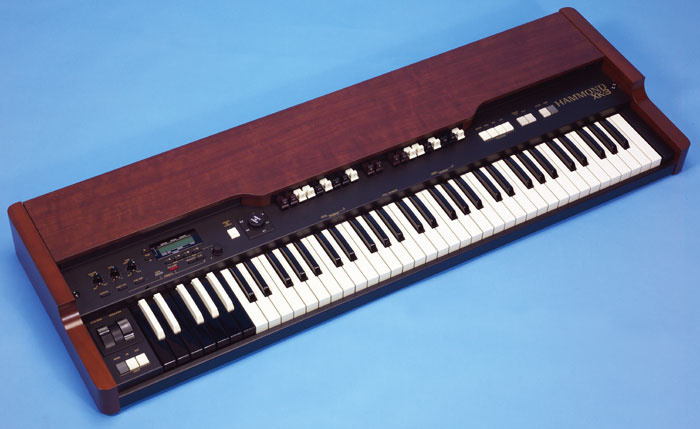 This is simply a second keyboard — identical to that of the XK3 and complete with reverse-coloured preset keys — housed in a matching wooden frame that sits neatly beneath the XK3 to form a composite dual-manual organ, as shown in the picture at the head of this article (the XK3 is also sold together as the XK33 Prolite package, which includes the XLK3 and the optional stand). 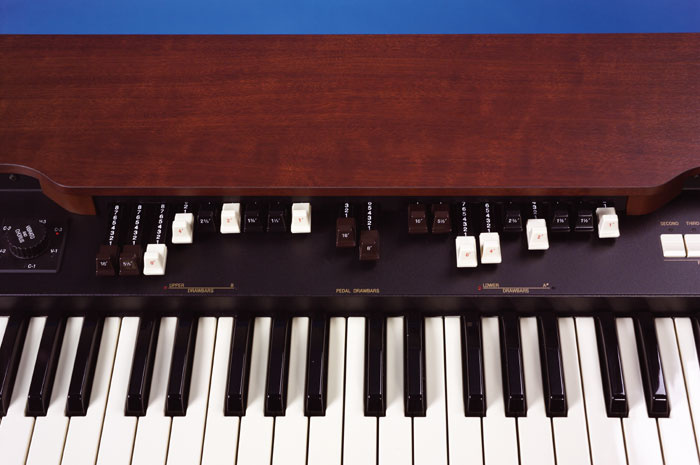 The wooden side panels are styled to resemble a traditional console organ, and the whole thing makes a very portable and very playable dual-manual organ system. A large part of playing the Hammond is, well, how you play the Hammond — by which I mean the tactile way the player manipulates the controls, especially the drawbars and Leslie controls. 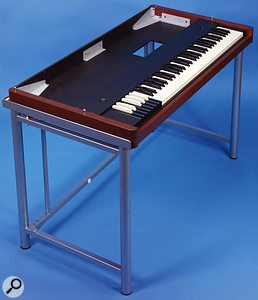 The XK3 is set up in a very similar way to a traditional console Hammond organ, and most of the functionality will be immediately familiar to Hammond players, but there are also some significant departures to enable a range of additional features and facilities more appropriate to this kind of live-performance keyboard. To the left-hand side are three rotary controls to adjust the master volume, tone and valve overdrive. There is also a backlit LCD screen with four 'soft' keys and a pair of page up/down buttons to navigate the various configuration menus, plus a data input knob. By default, the display shows the current drawbar settings, either as graphical bar-graphs or as slider numbers, along with the preset key and name, and the current tone control value. Below the LCD panel are seven more push buttons to access the menu system, store or recall presets, and to select various functions such as the tube distortion or the frequency band affected by the single tone control knob. Since the reverse-coloured preset keys don't latch down, LEDs above each key are used to identify which preset is currently in use, and when separate upper and lower presets are in use, the upper preset is shown by a steady light, and the lower by a blinking light. To the right of this control section is the start of the more traditional-looking controls: the rotary vibrato/chorus selector is accompanied by a single on/off button, and two sets of nine drawbars are separated by a pair of pedal drawbars. These two sets of nine can be switched to operate either as the A# and B preset's live drawbars operating on a single manual, or as separate upper and lower live drawbar sets when using the split-manual mode or when using an external MIDI manual or the XLK3. At the right-hand side of the XK3 are eight more buttons, each with an integral LED. The first four control the percussion effect: second and third harmonics, fast decay and soft modes. Traditional console organs offered the choice of second- or third-harmonic percussion. However, the XK3 allows both at the same time, and although this confused me at first it allows for a more interesting tone combination. The next two buttons configure the keyboard to allow the bass pedal section to be played from the bottom end of the keyboard, and to engage the split keyboard mode with separate upper/lower drawbar settings. The last two buttons select the built-in digital reverb and activate the Demo song playback mode — although this last button can (sensibly) be reprogrammed for a variety of other functions including activating an external MIDI zone, switching the vibrato/chorus on/off, or switching the Leslie speed. The last two are very handy options as they allow these features to be controlled with the right hand (even while holding down the keys, at a stretch), instead of the left, which can make it easier to add effects without breaking the rhythm or flow of a left-hand bass, for example. To the left of the keyboard, where you'd find them on a conventional synth, there's a pair of wheels for pitch-bend and modulation. These aren't usual tools on a Hammond, but they're useful for controlling other keyboards, and can be assigned to control the actual pitch or virtual tonewheel motor speeds and the Leslie speeds, respectively, if required. The Leslie Brake, On and Fast controls can be found on the side cheek too — although if you prefer the traditional half-moon Fender switch screwed to the front rail, you can apparently order this as a custom option from Hammond instead. The reverse-coloured presets provide a significantly greater range of control than on a traditional Hammond. Not only can you select different preconfigured drawbar settings by pressing the different keys, but each preset also stores a range of other keyboard parameters including vibrato/chorus settings, Leslie parameters, distortion characteristics, tone controls and so on. So selecting a different preset can completely change the sound of the instrument in a way which the vintage console organs could never do. Furthermore, there aren't just the nine preset keys to play with (C normally being a cancel mode and A#/B being live drawbar selectors). Every preset key can store a different configuration, and can also access a different memory bank — so by my reckoning there are 132 different preset memories available, which should cover every possible eventuality, no matter how complex your gig is or how diverse your playing style! Configuring the instrument is a relatively painless process once you have become familiar with the LCD menu system. Pressing the menu key accesses the last-used menu screen (there are five in all), showing up to four sub-pages. The different menu pages are called up using the Page up/down buttons to the left and the sub-menus are accessed by pressing the appropriately numbered soft key. Each sub-menu page then shows four parameters and additional parameters are found by pressing the Page up/down keys again. Pressing the relevant soft key for each of the four displayed parameters assigns the data knob to that function so that it can be changed. Many of these menu configurations allow the instrument to be honed to reflect specific characteristics of traditional Hammond console organs, but many others allow the XK3 to do things no vintage instrument ever could. Two of the more useful examples are that the percussion volume can respond to the note velocity, and the envelope can be retriggered with every note even when playing legato. Anyone who knows anything about the Hammond organ sound knows that a very large part is down to the Leslie rotary speaker. The original mechanical designs have (arguably) never been bettered, and employ contra-rotating horn and baffle arrangements to distribute the organ sound in different directions and at different speeds. This produces a very complex and constantly changing combination of direct and reflected sounds, with both amplitude and frequency modulated components. Modern DSP-based simulations are pretty good these days, especially for live applications, but in a recording situation — and for the top-flight live performers — it is hard to beat the real acoustic impact of the sound being splashed around a room by a rotating horn. Hammond-Suzuki acquired the rights to the Leslie name a long time ago, and have been making a small range of Leslie models to accompany their organs ever since. The portable system reviewed here, which was supplied with the XK3 for review, comprises the 2101 rotary treble horn unit and its matching 2121 stationary/bass unit. Both were intended for live performance rather than home installation. Although designed to complement compatible Hammond organs and sound modules, these units can also be used with a broad range of instruments including other keyboards and synths, guitars, and even vocals. The larger of the two Leslie units is also the simplest — the floor-standing 2121 stationary speaker. This self-powered, two-way reflex design incorporates a static 15-inch woofer and a compression treble driver which is coupled to a wide dispersion fixed horn — much like a standard compact PA speaker (you can see a picture of it with the 2101 at the top right of the web page at www.hammondorgan.co.uk/leslie.htm). The frequency range is quoted as 40Hz to 15kHz, crossing over between the two drivers at a nominal 700Hz, and the system is capable of a substantial 121dB SPL at a distance of one metre thanks to its internal solid-state 150W bass amp and 50W treble amp. The vinyl-covered wooden cabinet measures 506 x763 x 506mm (whd) and weighs 39kg, so the wheels and chunky side handles make moving it around a little easier. Although the review model was black, there are also silver and walnut cabinet versions available, identified as the 2122 and 2123 respectively. The rear panel caters for three input channels (the first with a insert point), two-band equalisation, master volume, and a line output (to feed a second self-powered cabinet or front-of-house desk). The first input channel is equipped with a rotary level control, an XLR combi-jack socket, and a switch to select the unbalanced line (jack) or balanced mic (XLR) inputs. The mic mode has a nominal sensitivity of -40dBu, while line is -20dBu, and there is a slide switch to activate a 24V phantom power supply for the XLR input. It has to be said that the mic input circuitry seems to be an odd design. Not only does it provide an unusual phantom voltage which limits the range of condenser mics that can be used, but it also presents an unusually low input impedance of 600Ω. When switched to line input, the impedance is relatively high at 50KΩ, and I presume this is intended to serve as a guitar input. Only the first channel benefits from an insert point, and is the usual unbalanced arrangement using tip and ring contacts on a three-pole quarter-inch socket, operating at a nominal -6dBu signal level. The second and third input channels are unbalanced line inputs on quarter-inch jacks, with a nominal level of -15dBu and 10KΩ input impedances. Each input has a rotary level control and all three inputs are mixed together and made available as an unbalanced line output at a nominal 0dBu — useful for providing a DI feed to the front-of-house desk or for driving a second powered speaker. This mixed input signal is also routed through a simple bass and treble tone control arrangement, and then to a master volume control feeding the internal amplifiers. A small trim control allows the treble amp gain to be adjusted over a ±5dB range to fine tune the spectral balance of the system independently of the tone controls. Beside the usual IEC mains inlet connector and rocker-style on-off switch is a co-axial DC socket labelled 'Remote'. This accepts a control signal from the 2101 unit (see overleaf) to switch the speaker's mains power on automatically when the 2101 is powered on and off, which is a nice idea. Sadly, the amplifier chassis is cooled by a small, high-speed fan mounted on the rear panel. On the review model — which, to be fair, had already suffered from a hard gigging life — this fan was incredibly noisy. I am told that the fan was in need of replacement and the noise it made is not representative of the model in general, but this may be something to watch out for, nonetheless. The 2101 treble unit, although rather more compact than the 2121, is by far the more complex product of the two, and acts as the control and signal processing hub for the complete system. Like the stationary speaker, the 2101 is a self-contained, self-powered design, incorporating three separate channels. 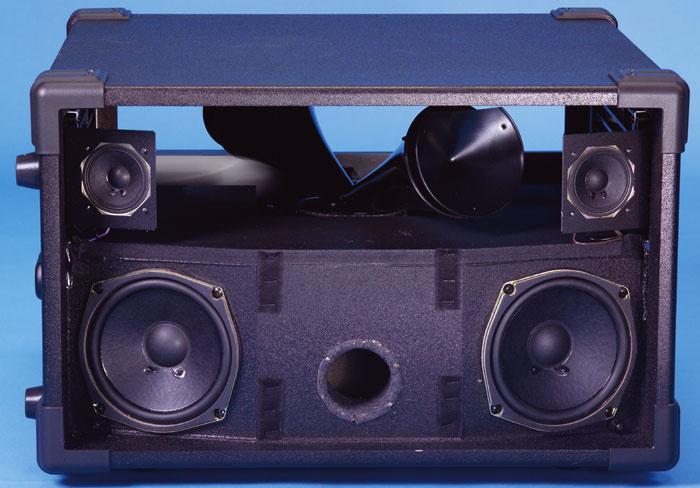 A 50W solid-state amp drives a compression driver coupled to the rotating horn, while a further pair of 50W amps drive two fixed speaker channels — effectively a stereo replay system built into the one cabinet — and each channel comprises a five-inch 'woofer' and a two-inch tweeter. The black vinyl-covered cabinet measures 510 x 520 x 330mm (whd) and weighs 23kg, with strap handles on both sides. The signal flow within the unit is quite complex but fundamental to the way the unit operates, both alone and with the 2121 stationary unit. The system accepts four inputs: two for the rotary horn, and two for the stationary stereo speakers. The first of these is a line input via a quarter-inch jack to feed the rotary channel. The other three are all provided via the standard 11-pin Leslie connector. There are also four outputs, all on unbalanced quarter-inch sockets. The two stationary channels are made available directly at the 'Stationary and Bass' line outputs, and incorporate the very low-frequency element of the rotary input channel as well. The remaining two outputs carry a stereo digital Leslie simulation for the low and mid-range frequencies of the rotary inputs. The two rotary feeds from the direct line input and Leslie connector are combined together and fed to a three-band crossover. High-frequency signals above about 800Hz are routed directly to the rotary horn amplifier and on to the horn itself, while very low-frequency signals below 125Hz are separated and passed directly to the left and right stationary amplifier channels, unprocessed in any further way. Although it seems a little odd, this is actually a standard feature of most modern Leslie speakers (ie. those with 11-pin interfaces) — although the notable exceptions include the 705, 720 and 122XB models. This very low-frequency component is also made available at the 'stationary and bass' line outputs as mentioned above. The rotary signal between 125 and about 800Hz is processed with a digital rotary speaker simulation, emulating the relatively straightforward characteristics of the bass rotor in a conventional Leslie. The stereo output of this DSP simulator is passed to the internal left and right stationary channels, as well as to the stereo 'low-rotary' channel line outputs, as already mentioned above. So, to summarise, the high-frequency part of the rotary channel signal is handled by the horn rotor, the mid-frequency part is processed digitally with a Leslie simulator and reproduced in stereo from the fixed speaker channels, and the low-frequency part is left unmolested and reproduced by the fixed channels (in mono). With this level of signal-flow complexity, it will come as no surprise that the rear control panel is equally complicated. On the left-hand side is a rocker switch to power the unit, an 11-pin Leslie connector, and IEC mains inlet, and a co-axial remote control socket. The last is provided for linking with the 2121 stationary speaker to switch that unit on automatically when the 2101 is powered. It is also worth noting that the 2101 is itself switched on remotely when a control signal is received via the 11-pin Leslie connector (something which is provided automatically when a suitably equipped organ is switched on). Besides the ability to transfer the mono rotary channel and stereo stationary channel, the 11-pin Leslie connector also conveys the speed-switching control signals. A separate eight-pin DIN socket is provided to accept the signal outputs from older digital Hammond products like the XB1 keyboard and XM1 sound module, and is, in effect, a miniaturised and simplified version of the 11-pin Leslie connector. The separate mono line input quarter-inch socket allows other instruments to access the rotary channel, but there is no provision for external inputs to the stereo stationary channels. Two more quarter-inch sockets accept footswitch connections to control the rotor speed and to switch between two DSP configuration presets. MIDI In and Out are catered for, the former to enable remote control and adjustment of various DSP parameters in the 2101, and the latter to allow a second 2101 to be controlled remotely (and for data dumps). The operational controls consist of three level controls (left and right stationary channels plus the rotary channel), and there are recessed trimmers to adjust the bass (under 125Hz) and horn (above 800Hz) levels relative to the mid range. A fourth rotary control sets the amount of amplifier overdrive affecting the rotary channel, and a recessed slide switch reconfigures the stereo stationary channels to operate in mono, or mutes them completely. This last mode is employed when the 2101 is used in conjunction with the 2121 stationary bass unit, which can handle far higher replay levels than the 2101 alone. There's also a small group of controls to adjust various aspects of the system, comprising a rotary selector, a data wheel, two touch buttons and a numeric LED display. When the 2121 and 2101 are used together, the organ signal is connected to the 2101 via the 11-pin socket and three connections are made from it to the 2121 bass unit. The left channel of the Stationary/Bass output is hooked up to input two of the 2121, the left channel of the low rotary channel is linked across to input three, and the power-switching remote lead is plugged in so that everything comes on together. If a second 2121 is available, then the right stationary/bass and low rotary channels can be patched in to give a wider stereo effect (as well as more volume). It's all very quick and simple to rig up. The complete system is capable of serious volume — enough to keep up with the most efficient guitar amps or the loudest drum kit — and provides great Leslie sound. The horn is clearly the key to this, but the DSP system makes a very convincing job of simulating the lower rotor of conventional Leslie cabinets too. Of course, everyone has a slightly different idea of what makes the ideal Leslie, and history documents dozens of different tweaks that the professionals have made over the years to their classic 122 and 147 Leslies. To that end, the 2101 can also be customised in a variety of ways to tailor the sound precisely as required. For example, the fast and slow running speeds of the mechanical rotor and the DSP bass-rotor simulation can be adjusted independently and with considerable precision to simulate different pulley sizes and motor speeds. Similarly, the time taken for each element to speed up, slow down, or come to a complete stop can be changed to simulate belt condition, type of rotors, and so on. The rotor speed can also be controlled directly using a modulation wheel on a suitably equipped keyboard, or by an expression (volume) pedal, if desired. If controlled via a simple footswitch, the system can be configured for latching or momentary actions. The direction of the horn rotor can be reversed (useful when more than one 2101 is used) and its resonant character can be altered to simulate horns without baffles or different drivers. The crossover frequency between bass rotor and horn, and the low-frequency cabinet resonance can also be adjusted to simulate different traditional Leslie systems, and the virtual microphone angle and stereo spacing can be adjusted to change the character of the DSP low-rotor simulation. Facilities are also provided to assign the MIDI control channel (for remote parameter changes) and program change channel (for recalling one of the two preset settings). Once set up, any combination of settings can be programmed as one of two Presets, allowing two different sound and operating characters to be stored for instant recall. On its own, the 2101 lacks the power and weight to deliver a convincing low end for on-stage levels, and partnering it with at least one 2121 makes a lot of sense. 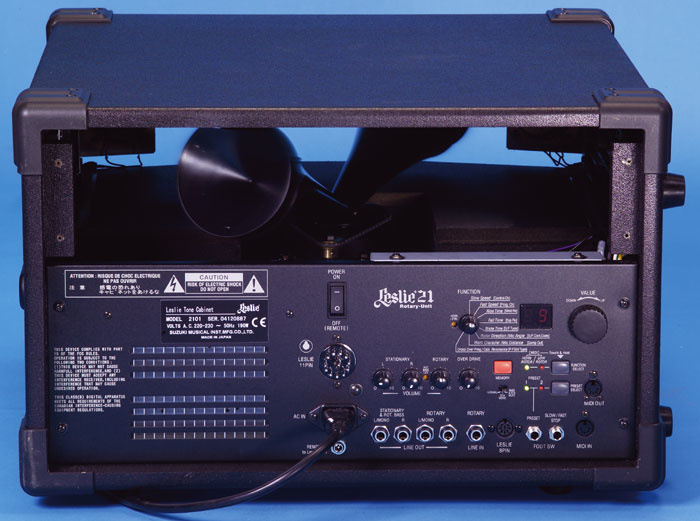 However, in situations where a full PA and powerful foldback is being used, the 2101 would suffice on its own, with DI's being taken for the low end and mid range, and a couple of mics being used for the horn rotor. This Leslie system is very compact, and because it comes in two parts, it's far more easily transported than a full-size 122 cabinet, for example, or even a 147. Indeed, the complete Leslie system with XK3 organ, stand, pedalboard and accessories all slotted into the back of a modest estate car without any problem whatever. The Leslie sound is very good indeed, especially if a little care is taken to fine-tune the frequency balance and optimise the speed parameters to personal tastes. The idea of combining mono bass, synthesized rotary mid-range and a real rotating horn sounds too complex to work, but work it does, and very impressively. In 2003, I was mightily impressed with the New B3, because it was such a remarkably faithful recreation of the real thing, physically and sonically, and yet still provided a lot of facilities to modify and tweak the sound to suit personal preferences. However, its appeal to the typical gigging musician in a band was limited because of its vast cost and size. Hammond's XB series of digital portable organ keyboards have generally been well received over the years, but have never quite reached the holy grail of the vintage sound so many have aspired to. The new XK3 is where the two conflicting requirements meet, offering the sonic quality and flexibility of the New B3's VASE engine combined with the practical convenience and usability of the XB-style single-manual keyboards. I'm confident that the absence of the multi-contact switching will go completely unnoticed by the vast majority of players, and the bonus of external MIDI control will more than make up for it for most people. The key-click generation is very controllable to suit personal preferences, and although it doesn't have quite the tactile response of the multi-contact arrangement, it certainly exudes the right sound character. Indeed, the quality of the organ sound is exemplary, and I can think of no similarly priced equals. Only the New B3 and arguably the best of the recent software emulations match or better it — and the latter obviously lack the physical and tactile control elements necessary for a live performance keyboard. The XK3's internal DSP Leslie simulation is also among the best I've heard, although there is still nothing quite like a real rotating horn. However, that's what Hammond's various current Leslie options are for, such as the impressive 2101/2121 system supplied with the XK3 for this review. The optional and removable XLK3 lower manual is a nice idea, allowing you to expand the XK3 to a dual-manual and pedal combo if required. I think this will appeal to the jazz trio set, although multi-keyboard players can gain much the same practical playing benefits with any MIDI keyboard, of course. The fact that it is a separate unit not only makes transportation easier, but also enables the organ to be expanded later, as funds and playing requirements allow. However, one thought that struck me about the two-manual combo version is the potential limitation of its 61-note keyboard. For example, you might want to control a piano or string sound from the lower keyboard during a gig. If you were playing with two hands on the same keyboard, it would be really useful if the lowest reversed-colour octave could be allowed to send MIDI note data with the rest of the keyboard to give a six-octave span instead of five. Although not possible with the current operating system software, this is apparently something that Hammond are considering for a future update. If Hammond sounds feature large in your compositions or live keyboard repertoire, then the XK3 should be at the top of your wish lists, because it represents the absolute pinnacle of this kind of live performance keyboard. The sound is absolutely authentic, the design and ergonomics of the performance controls make playing the instrument a dream, and the extensive configurability of the instrument caters for a wide range of personal preferences, playing styles, and external control options. What more could anyone ask? Affordable price for a fully featured, great-sounding performance organ. Authentic-sounding tone from the VASE sound engine, as used in the New B3. Offers both MIDI In and Out, unlike the New B3. XKL3 option allows expansion to two manuals. Decent built-in Leslie simulator (although the results from the stand-alone units reviewed in this article are even better). Detailed control over the modelled tonewheels is accessed via a complex menu-driven system. Lowest octave of the keyboard cannot be used for playing. This is as on original Hammonds and the New B3, but given that the lowest keys on the XK3 are keys and not switches, it would be nice to have the option of using all 73 notes. The XK3 successfully combines the portability of Hammond's XB-series digital organs with the New B3's more faithful rendition of the tonewheel sound. The result is an affordable, great-sounding performance keyboard for both studio and live applications, especially when used with the Leslie options also reviewed here. Hammond XK3, £2199; XLK3 second-manual expander for XK3, £1099; Optional stand, £TBC (expected to between £200 and £300); Leslie 2121 Bass unit, £899; Leslie 2101 Treble unit, £999. All prices include VAT. Hammond Organ UK +44 (0)1582 768296.